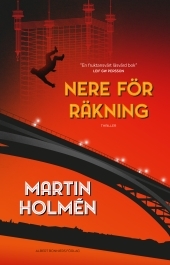 Ex-boxer Harry Kvist is barely out from his 18 month long haul the Långholmen prison before an old promise forces him to return to the underbelly of 1930’s Stockholm society. His friend Beda is dead, but was she really murdered by her own son? In a race against the clock, Kvisten and Beda’s daughter Elin hunt for clues that will help them uncover the truth. Their investigation will take them through a rainy Stockholm and eventually leads them so high up the ladder and into the highest pinnacle of society that it boggles the mind. Now it's kill or be killed. DOWN FOR THE COUNT is the second, stand-alone instalment of the Harry Kvist-series. The series began with CLINCH (2015) and will end with SLUGGER, due out from Albert Bonniers Förlag in 2017.